KD Fasteners, Inc.’s Monel 500 flat washers are great washers for the marine and chemical industries. 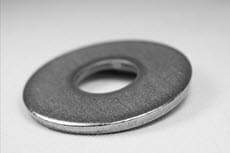 Monel 500 flat washers are strong and corrosion resistant. They also have good toughness at high temperatures, low permeability and are non-magnetic at temperatures as low as -150°F. They remain corrosion resistant in environments ranging from pure water to non-oxidizing mineral acids, salts and alkalis. Finally, Monel 500 flat washers offer excellent resistance to high-velocity sea water and resistance to a sour gas environment. We offer washers to the specific dimensions and plating that you need. We offer off-the-shelf sizing ranging from 0.062 to 12 inch inside diameter and thicknesses from 0.002 to ½ inch. Whatever Monel 500 flat washer you’re looking for, if we don’t have it on our shelf, we can quickly manufacture if for you. Our washer capabilities range from small (under 100 pieces) to large runs. We will custom make your Monel 500 flat washers to your exact specifications. Contact us today by calling 1-800-736-5014 or filling out our contact form.